His judgment upon our world during these final years. day dawn, and the Day Star arise in your hearts"
"But God is the Judge: He putteth down one, and setteth up another. For in the hand of the LORD there is a Cup, and the wine is red; it is full of mixture; and He poureth out of the same: but the dregs thereof, all the wicked of the Earth shall wring them out, and drink them"
"Thrust in thy sharp sickle, and gather the clusters of the vine of the Earth; for her grapes are fully ripe"
before my Lord and Master. I look for that time, that latter-day glory." Concerning Dates- these articles will mention dates that have come and gone. They were human guesstimations-- not the infallible Word of God. However, the articles will retain these dates- though incorrect- because it is our belief that the correct dates cannot vary from these articles by much. The Tribulation Week will start SOON. Biblical framework so that True Saints can gauge who OUGHT to be believed. A Sober Warning to Those Who Look for the Pre-Tribulational Rapture (from Jesus' Matthew 25 Parable of the Ten Virgins). How can one impostor-- the Antichrist-- so completely deceive the world?... A fourth of mankind will die under the Fourth Seal Judgment (Revelation 6:7-8) directly or indirectly because of the slaughter caused by the Antichrist. Christians will be martyred under the Fifth Seal Judgment (6:9-11) due to the persecution of Antichrist. Multitudes more of the Tribulation Saints will be martyred shortly thereafter, when they refuse the Mark of the Beast at the Middle of the Tribulation Week. "7 And it was given unto him [Antichrist] to make war with the Saints, and to overcome them: and power was given him over all kindreds, and tongues, and nations. 8 And all that dwell upon the Earth shall worship him, whose names are not written in the Book of Life of the Lamb slain from the foundation of the world" (13:7-8)... The Fountain of Living Waters (Jeremiah 2:13) or Broken Cisterns (2:13). Christ or Antichrist. Sound Doctrine or the Lie. The choice seems so stark by comparison, but the practicality is that the vast majority will not see the difference. "What does God have to do to get our attention? This brings us to the events of December 26th 2004, where an undersea earthquake with a magnitude of 9.0 occurred in the Indian Ocean off the western coast of northern Sumatra and Indonesia, thus generating a series of tsunamis, whose massive, 50 foot (15 meter) high waves devastated Indonesia, Sri Lanka, India, Thailand, and other coastal nations over the next seven hours, killing more than 150,000-- with a greater death toll feared for those missing never to be found and those who would become casualties of disease and starvation." "And at midnight there was a cry made, Behold, the Bridegroom cometh; go ye out to meet Him" (Matthew 25:6). "California's rolling blackouts have the potential of putting on the economic brakes of the 'World's Sixth Largest Economy'. According to the Legislative Analyst's Office of the State of California December 2000 report on 'California's Economy and Budget in Perspective'... And, if we can no longer see light at the end of the tunnel, but 'hear of wars and commotions, be not terrified' (Luke 21:9). This is only evidence that our LORD's return for us is all but upon us. 'Then look up, and lift up your heads; for your redemption draweth nigh' (21:28)." A Sign of the Second Coming of the LORD Jesus Christ, and of the End of the World. "Righteousness exalteth a nation: but sin is a reproach to any people"
American Christians, like their brethren scattered throughout the world, need to be clinging to the Promises until our Saviour comes for us. The Promises make us holy like our Master, and enable us to escape. "Whereby are given unto us Exceeding Great And Precious Promises: that by These ye might be partakers of the Divine Nature, having escaped the corruption that is in the world through lust" (2Peter 1:4). Especially now, those who are truly watching and waiting for their LORD are a Little Flock. However, "Fear not, little flock; for it is your Father's good pleasure to give you the Kingdom" (Luke 12:32). "Harpazo" (har-pad'-zo) is the Greek word which the New Testament translators have rendered as "caught up". "I knew a man in Christ above fourteen years ago, (whether in the body, I cannot tell; or whether out of the body, I cannot tell: God knoweth;) such an one caught up [Greek, harpazo] to the Third Heaven" (2Corinthians 12:2). "Rapture" is taken from an obsolete French word, which means "abduction" or "to carry off". Though Greek scholars may refrain from using "rapture" to translate "harpazo", it is not a wresting of Scripture for the honest Christian to see the connection between the two. "According to your faith be it unto you" (Matthew 9:29). The inability to discern a false prophet from a true prophet, will open the way for the deception of the False Prophet. Again, What About No Man Knows the Day or Hour? But, What About the Prophecies of These Modern Prophets? Then, What About the Signs and Wonders? When physical escape is no longer an issue. Would the Saints' departure from this world at the Pre-Tribulational Rapture serve the LORD's purpose in the judgment of this world? "Our cattle also shall go with us; there shall not an hoof be left behind; for thereof must we take to serve the LORD our God" (Exodus 10:26). Those who are surprised by His Coming, are like those surprised by a thief. "Behold, I come as a Thief. Blessed is he that watcheth, and keepeth his garments, lest he walk naked, and they see his shame" (Revelation 16:15). But, when the LORD Jesus Christ comes as a Thief, what will He rob "the surprised" of? I believe that "the surprised" will be the Foolish Virgins (Matthew 25), who will be robbed of their departure at the Pre-Tribulational Rapture. "For I am the LORD: I will speak, and the Word that I shall speak shall come to pass; it shall be no more prolonged: for in your days, O rebellious house, will I say the Word, and will perform it, saith the LORD GOD" (Ezekiel 12:25). The mockers of Ezekiel's day coined their own parable about all the prophecies and visions that predicted a coming judgment for the iniquity of their nation-- "The days are prolonged, and every vision faileth" (Ezekiel 12:22). In other words, the scoffers were saying that the prophesied days are extended to some future time-- if at all. Besides, all the other visions and prophecies have failed to materialize, as well. The LORD's response is to silence the scoffers' parable with the fulfillment of the vision. "Tell them therefore, Thus saith the LORD GOD; I will make this proverb to cease, and they shall no more use it as a proverb in Israel; but say unto them, The days are at hand, and the effect [fulfillment] of every vision" (Ezekiel 12:23). "And in the morning, It will be foul weather to day: for the sky is red and lowring. O ye hypocrites, ye can discern the face of the sky; but can ye not discern the signs of the times?" (Matthew 16:3). "For any True Christian, knowing or not knowing the "day and hour" (Matthew 24:36) of Christ's return or of the Pre-Tribulational Rapture, is truly a non-issue, compared to the destiny of the hypocrite, who discerns not the "signs of the times" (Matthew 16:3). The real issue is Perfect Love, that is, "Do we give to Christ the obedience that demonstrates that we are His friends?" "Ye are My friends, if ye do whatsoever I command you" (John 15:14). Contention over the whole topic of knowing or not knowing the day and hour of the LORD's return, would vanish if our hearts were not embittered over disappointments experienced, because the LORD Jesus delayed His coming. Again, "for the vision is yet for an appointed time, but at the end it shall speak, and not lie: though it tarry, wait for it; because it will surely come, it will not tarry" (Habakkuk 2:3). Allow the Sovereign God the time to work out His purpose in completing the Body of Christ and working out His judgment of the world. "And all the inhabitants of the Earth are reputed as nothing: and He doeth according to His will in the army of Heaven, and among the inhabitants of the Earth: and none can stay His hand, or say unto Him, What doest Thou?" (Daniel 4:35)." "First, 'Except the LORD of Hosts had left unto us a very small Remnant, we should have been as Sodom, and we should have been like unto Gomorrah' (Isaiah 1:9). Such a time as has never been before is coming, and cannot come until the Remnant be removed. The Restraining Influence of the Holy Spirit as felt through the saltiness of True Believers must be removed through a Pre-Tribulational Rapture, then the Seven Year Tribulation of Daniel's Seventieth Week can begin. 'For the mystery of iniquity doth already work: only He who now letteth [restrains] will let [restrain], until He [the Holy Spirit] be taken out of the way' (2Thessalonians 2:7)." Armageddon is the final showdown between the LORD Jesus Christ and the Antichrist. "We shall all stand before the Judgment Seat of Christ" (Romans 14:10). Let no mistake be made that any Saint's perseverance in holiness can be a tribute to man; instead, our perseverance is a testimony to the God that sustains and empowers by His grace. For "by the grace of God I am what I am" (1Corinthians 15:10). It will be seen in Heaven that though our willing cooperation in our own perseverance was absolutely necessary, it was God's faithfulness that made it all possible. "Even if you feel comfortable with but few charitable organizations-- and of course, do not ever contribute contrary to your conscience or sensibilities-- obvious benefit will be gained by those who will receive donated canned goods, articles of clothing, money, etc., when you obey the Scriptural directive: 'Do good and to communicate [Greek, koinonia, share] forget not: for with such sacrifices God is well pleased' (Hebrews 13:16)." The Last Trump and the Pre-Wrath Rapture. "But if from thence thou shalt seek the LORD thy God, thou shalt find Him, if thou seek Him with all thy heart and with all thy soul" (Deuteronomy 4:29). "The Second Psalm is the most concise revelation of the Person and Nature of the Messiah in the Psalms. It begins with a prophecy of the opposition of both Gentile and Jew against the LORD and His Messiah, and manifests Jehovah's wrathful displeasure in their rebellion. "1 Why do the heathen [i.e., the Gentiles] rage, and the people [i.e., Israel, God's peculiar people] imagine a vain thing? 2 The kings of the Earth [i.e., Rome's Pontius Pilate] set themselves, and the rulers [i.e., Israel's Herod Antipas] take counsel together, against the LORD, and against His Anointed [Hebrew, mashiyach, meaning Messiah], saying, 3 Let us break their bands asunder, and cast away their cords from us [i.e., both Gentile and Jew assert their intention to break God's Law and live in open rebellion of Jehovah's restraint]. 4 He that sitteth in the Heavens shall laugh: the LORD shall have them in derision. 5 Then shall He speak unto them in His wrath, and vex them in His sore displeasure" (2:1-5). The Almighty establishes the Kingdom of the Messiah; and accordingly, the Messiah declares Himself to be the Son of God and royally decrees His Own Universal Dominion. "6 Yet have I set My King upon My holy hill of Zion. 7 I will declare the decree: the LORD hath said unto Me, Thou art My Son; this day have I begotten Thee. 8 Ask of Me, and I shall give Thee the heathen for Thine inheritance, and the uttermost parts of the Earth for Thy possession. 9 Thou shalt break them with a Rod of Iron; Thou shalt dash them in pieces like a potter's vessel" (2:6-9). Wisdom is to submit to God; and, the Salvation of rebellious man resides in making peace with the Messiah, placing their confidence in the beneficence of the Messiah, Who will ultimately set in Judgment over the whole Earth." "The Proverbs teach us that 'when the wicked rise, a man is hidden' (Proverbs 28:12). This concept is repeated later in the same chapter. 'When the wicked rise, men hide themselves' (28:28). Even the LORD Jesus 'escaped out of [the Jews'] hand[s]' (John 10:39); thus, delivering Himself. The Apostle Paul was delivered out of the hands of the Jews many times himself, including being let down the wall of the city 'in a basket' (Acts 9:25) at night. Certainly it is the sovereign choice of God to determine if, who, when, and how any of us would be delivered. But, did not the same LORD have the confidence to tell us to command Him concerning these matters? 'Thus saith the LORD, the Holy One of Israel, and His Maker, Ask Me of things to come concerning My sons, and concerning the work of My hands command ye Me' (Isaiah 45:11). Jehovah must have already anticipated our prayerful commands in advance of our praying, to be able to answer the requests without losing His sovereignty. 'Your Father knoweth what things ye have need of, before ye ask Him' (Matthew 6:8)." Scriptural principles for survival. The Holy Spirit will adapt the principles to your circumstances and understanding to give you the wisest means of survival. "I being in the way, the LORD led me" (Genesis 24:27). This small space of time will allow for additional people to be brought into the Body to respond to the LORD's Pre-Tribulational Rapture Call-- "Come Up Hither" (Revelation 4:1); but, more strangely-- I speak as a man-- it will probably sift and reduce the number who will still be ready. Thus, the Pre-Tribulational Rapture will take only the "finest of the wheat" (Psalm 147:14). "Whose fan is in His hand, and He will throughly purge His floor, and gather His wheat into the Garner; but He will burn up the chaff with unquenchable fire" (Matthew 3:12). "And I will bring the blind by a way that they knew not; I will lead them in paths that they have not known: I will make darkness light before them, and crooked things straight. These things will I do unto them, and not forsake them"
"True Saints need not fret that they do not understand all of the prophecies, for though they only 'know in part' (1Corinthians 13:9, 12), God will make their blindness as Light before them. 'And I will bring the blind by a way that they knew not; I will lead them in paths that they have not known: I will make darkness Light before them, and crooked things straight. These things will I do unto them, and not forsake them' (Isaiah 42:16). Understanding that Christ the Judge is returning soon to clean up the mess that man's sin has created-- in the world and in the Church-- is the key to understanding the prophecies. 'Behold, He cometh with clouds; and every eye shall see Him, and they also which pierced Him: and all kindreds of the Earth shall wail because of Him. Even so, Amen' (Revelation 1:7). God looks at the fulness of our hearts, not the emptiness of our heads. 'For if there be first a willing mind, it is accepted according to that a man hath, and not according to that he hath not' (2Corinthians 8:12). Though we are not to glory in our ignorance, we ought to use our ignorance as a platform to launch our request for understanding of 'things which must shortly come to pass' (Revelation 1:1)." "Who is Babylon the Great? The evidence of Scripture and the support of history indicate that Ancient Babylon has continued her whorish tradition through Roman Catholicism, inundating and polluting America, but still awaiting a final vehicle to forcibly include all people and all religious traditions in the ultimate worship of the Antichrist. "[Antichrist] opposeth and exalteth himself above all that is called God, or that is worshipped; so that he as God sitteth in the temple of God, shewing himself that he is God" (2Thessalonians 2:4). Though the Roman Pontiff has adopted the wait-and-see Gamaliel approach to the chartering of the United Religions Initiative (URI), if the Almighty soon chooses to remove His watching and waiting Saints by Pre-Tribulational Rapture, then the events of the ensuing Tribulation Week will take away the necessity of a voluntary, interfaith URI." "Why should Western Professed Christianity perceive of Islam and Hindu as solely heathen religions, when the humanistic, pagan Western Civilization also sets its face like flint against the religion of Jesus Christ? "2 The kings of the Earth set themselves, and the rulers take counsel together, against the LORD, and against His Anointed, saying, 3 Let us break Their bands asunder, and cast away Their cords from us... 7 I will declare the decree: the LORD hath said unto Me, Thou art My Son; this day have I begotten Thee. 8 Ask of Me, and I shall give Thee the heathen for Thine inheritance, and the uttermost parts of the Earth for Thy possession. 9 Thou shalt break them with a rod of iron; Thou shalt dash them in pieces like a potter's vessel. 10 Be wise now therefore, O ye kings: be instructed, ye judges of the Earth. 11 Serve the LORD with fear, and rejoice with trembling. 12 Kiss the Son, lest He be angry, and ye perish from the way, when His wrath is kindled but a little. Blessed are all they that put their trust in Him" (Psalm 2:2-12)." When we can better understand the LORD's reasons for tarrying, it makes waiting easier. "And the name of the star is called Wormwood: and the third part of the waters became wormwood; and many men died of the waters, because they were made bitter" (Revelation 8:11). "The New Testament Greek word for "star" is aster, as in asteroid. Providentially, the not-too-distant occurrence of the 3rd Trumpet Judgment (Revelation 8:10-11) of the Tribulation Week, places Wormwood-- the Asteroid of Judgment-- in prophetic focus. Apsinthos, the Greek word for "Wormwood", means undrinkable. "Therefore thus saith the LORD of Hosts, the God of Israel; Behold, I will feed them, even this people, with wormwood, and give them water of gall to drink" (Jeremiah 9:15). The Apocalypse of the LORD Jesus Christ prophetically discloses what appears to be the Earth being struck by an asteroid, with the result that the "third part of the rivers" and the "fountains of waters" (Revelation 8:10) became "wormwood" (8:11). The aftermath will be that "many men [will die] of the waters", and specifically, "because they were made bitter" (8:11). Man's injustice or lack of Godly judgment will provoke the Almighty to perform this monumental deed "when the transgressors are come to the full" (Daniel 8:23); but, the "judgments of the LORD are true and righteous altogether" (Psalm 19:9)." Complete with charts, tables, and reference footnotes. "If the book of Daniel might be read by itself no question whatever could arise. 'The Coming Prince' is there presented as the head of the revived Roman empire of the future, and a persecutor of the saints." "But the day is coming when 'our God shall come and shall not keep silence' [Psalm 50:3]. This is not a matter of opinion, but of faith. He who questions it has no claim whatever to the name of Christian, for it is as essentially a truth of Christianity as is the record of the life and death of the Son of God. The old Scriptures teem with it, and of all the writers of the New Testament there is not so much as one who does not expressly speak of it. It was the burden of the first prophetic utterance which Holy Writ records; ['And Enoch also, the seventh from Adam, prophesied of these, saying, Behold, the LORD cometh with ten thousands of His Saints' (Jude 1:14)] and the closing book of the sacred Canon, from the first chapter to the last, confirms and amplifies the testimony." "The only inquiry, therefore, which concerns us relates to the nature of the crisis [i.e., the Judgment of the Earth] and the time of its fulfilment [i.e., the duration of the Tribulation and especially the Second Coming of the LORD Jesus Christ]. And the key to this inquiry is the Prophet Daniel's vision of the seventy weeks." "Howbeit when He, the Spirit of Truth, is come, He will guide you into all Truth"
What a promise is this for the humbly inquiring mind! We desire to know the truth and to enter into it. We are conscious of our own aptness to err, and we feel the urgent need of a guide. We rejoice that the Holy Spirit is come and abides among us. He condescends to act as a guide to us, and we gladly accept His leadership. "All truth" we wish to learn, that we may not be one-sided and out of balance. We would not be willingly ignorant of any part of revelation lest thereby we should miss blessing or incur sin. The Spirit of God has come that He may guide us into all truth: let us with obedient hearts hearken to His words and follow His lead. "Fear not; for thou shalt not be ashamed"
We shall not be ashamed of our faith. Carping critics may assail the Scriptures upon which we ground our belief, but every year the LORD will make it more and more clear that in His Book there is no error, no excess, and no omission. It is no discredit to be a simple believer; the faith which looks alone to Jesus is a crown of honor on any man's head and better than a star on his breast. "Thy people shall be willing in the day of Thy power"
from: TODAY'S ENTRY ---New Window This feature is updated daily. from "Faith's Checkbook" ---New Window A Daily Devotional by C. H.Spurgeon. "He spake; and the dead arose. And Lazarus heard, and came forth. George Mueller's "view of the Lord's coming. but to call out from it a believing church as Christ's bride." --from "George Mueller of Bristol" --- by A. T. Pierson, chapter 8: "A Tree of God's Own Planting"
"He bringeth them OUT of their distresses. He maketh the storm a calm." Pop up the menu with a right mouse click and listen to the verse in the Scripture window or listen to any passage starting where you are... Yes with this CD you can listen to the entire Bible without flipping a record or tape. It works in conjunction with your Online Bible version 8.11 or greater. It only works in computers, it will not work in your stereo equipment." Putting HIS WORD on your desktop! "He is Altogether Lovely. 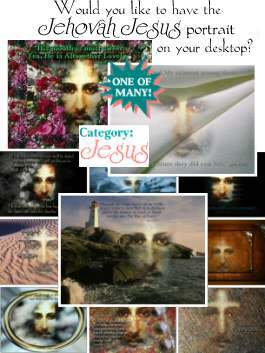 This is my Beloved, and this is my Friend"
Visit the "Jesus" section of "Altogether Lovely"
FREE desktop wallpapers in 6 categories.